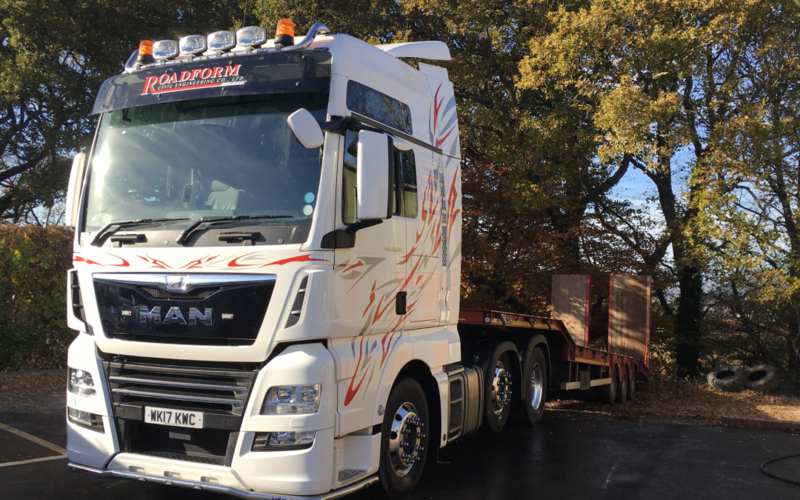 Roadform are now going to be able to provide faster and more efficient solutions for any project we’re faced with, thanks to our brand new MAN low loader truck. This formidable vehicle has stirred up excitement around the yard with its powerful engine and immense carrying power. Whatever job Roadform are called for, we are able to get the equipment we need on site fast, whether it’s just a simple paving project, or we need to pull out the heavier equipment for a big tarmacking job. This new vehicle means a more a stable loading and unloading process, as well as increased safety for our staff, which is always a top priority. Our new Low Loader truck has the characteristic white and red graphics and logo emblazoned right across the front – you won’t miss us on the roads! You can look out for our new truck all across the South West of England, where we’ve been providing the best civil engineering solutions since 1988. Roadform have been delivering quality service to both local authorities and private clients for a long time, and have built up a reputation that we’re very proud of. We hope to continue building upon this reputation by investing in quality vehicles like our new loader truck, so we can get the job done right. All our staff are fully trained in how to use the MAN low loader to get the right equipment on site, as well as being CSCS qualified and Safe Plus trained, so you can rest assured you’re hiring an efficient team that is ready for any project. If you want more information on how Roadform can make a difference to your civil engineering project, now with the help of our brand new MAN low loader truck, contact us today. Whether you need road building, civil engineering or site development, Roadform are sure to have the right equipment and the right attitude to get it done, and our professionalism will ensure your project runs smoothly.